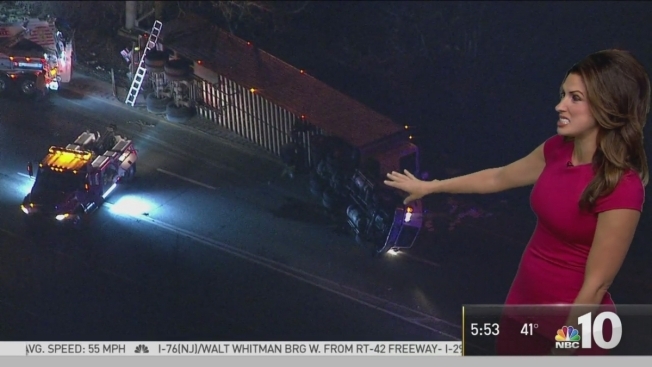 A tractor-trailer overturned overnight, blocking the ramp between two of the Philadelphia area’s busiest highways. The big rig flipped on the ramp from southbound Interstate 95 to northbound Interstate 476 (the Blue Route) in Woodlyn, Delaware County around 3:45 a.m. Wednesday. No word yet on the condition of the driver, said Pennsylvania State Police. The wreck closed the ramp for hours as crews investigated and worked on a plan to unload the trailer. As the morning rush picked up, traffic began to backup along I-95. If you need to go north on the Blue Route, you can access the roadway from MacDade Boulevard. The ramp from northbound I-95 remained open.